By law, Florida waters are owned by the citizens of Florida. Public access to Florida waterways is an important and aggressively protected right. A waterway is considered private only if all the land around the lake is privately owned and there is no water access from any public area. Most large Florida lakes have public boat ramps which have been grandfathered in over many years. For this reason, boating and fishing is a very popular pastime with Florida residents and visitors alike. For example, the Harris Chain has a number of large waterfront parks with numerous ramps and parking lots large enough to accommodate National Boating and Fishing Tournaments. The fact is, there are so many publically accessible lakes in our area that you can have a hard time deciding which lake to visit. In addition to our many lakes, the St. John's River borders Lake County on the East. This historic and scenic waterway, named the "Bass Capital of the World" runs north from deep Central Florida to the Atlantic Ocean in Jacksonville. The Harris Chain is part of the Ocklawaha River system which runs also into the St. John's River about 100 miles north of Mount Dora at Welaka. 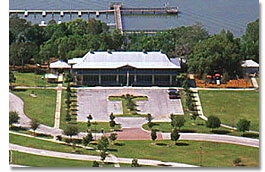 Numerous restaurants, boat ramps and waterfront resorts make the river very popular with fisherman and cruisers alike. Most small lakes in Central Florida are spring-fed which makes them great for swimming and water skiing. 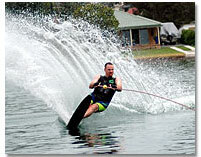 Many spring-fed lakes are not large enough for water skiing. There are some excellent waterskiing lakes in Florida, but lakefront property on these lakes commands a high premium because they are rare and very desirable. In recent years, developers have begun to advertise man made canals and rock pits as lakes to lure waterfront home buyers. It is best to keep water skiing activities to the larger public waterways to avoid causing wake damage or risk being involved with an irate fisherman or shoreline property owner. Cruising and fishing are also popular water activities in Florida. For example, the Harris Chain has numerous waterfront restaurants and miles of cruising waters. The Chain is also known for outstanding bass and crappie fishing. Public ramps are numerous allowing the lakes to be enjoyed by everyone.